It started as rumor. Spoken about only in hushed whispers, deep within locked channels, in the hardest to access areas in New Eden. As everyone else was worried with wars and empires, something was being uncovered: a fourth tier of Citadel. 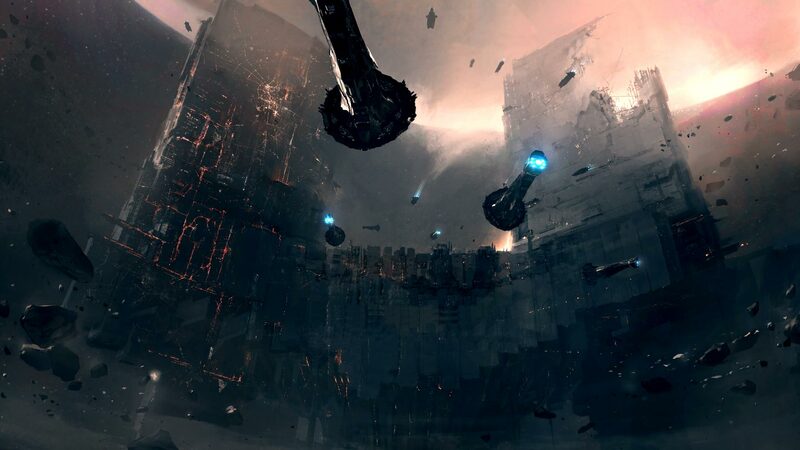 Originally thought to be an “XXL” Citadel, later data revealed it to be in fact a special form of the Keepstar XL Citadel. For months data miners speculated as to what possibly this unexplained record could be until one day they got a name: Palatine. Over time, more things were discovered about this mysterious new structure. Firstly, this Keepstar is unique. It has a rule that no other structure has: only one of them can be anchored at one time, anywhere. Along with that, the description and stats of the new ‘Super’ XL came out, namely an additional low slot, two more mids, double HP, and 25% more signature radius. It is additionally worth noting that the increased health does not come with an increased DPS cap, therefore any siege will take twice as long. This thing’s a beast. 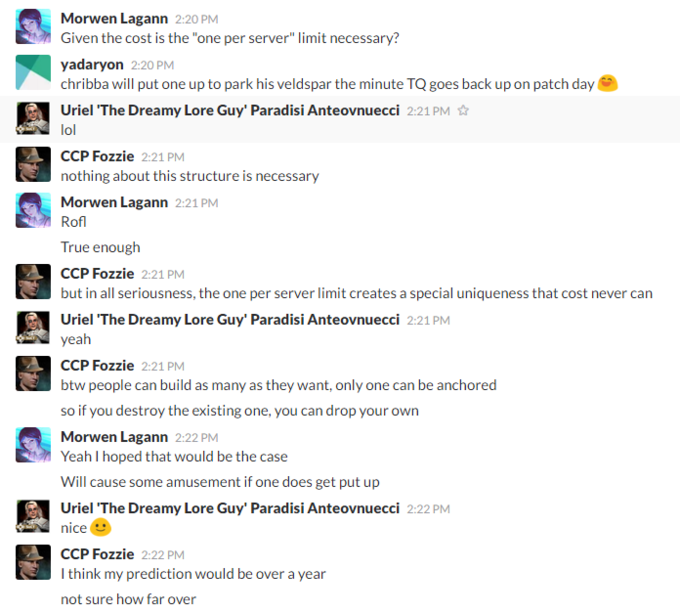 Finally, the silence was officially broken on Tweetfleet Slack as Fozzie dropped some fun bits of information about the new structure, simultaneously confirming its coming to a cluster near you. 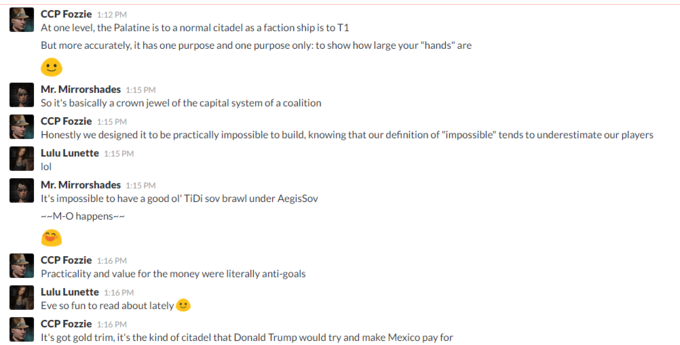 However, the conversation did not just end there, a while later he returned to come back and flesh out his meaning, openly comparing the construction of this citadel to the construction of the first titan (still regarded as one of the most epic moments in EVE history, if not video game history). This is important. As CCP continues forward they are putting a full court press to cater to Achievers and Explorers. In recent months we have seen more tournaments, challenges, races, and other opportunities for EVE players to prove they are the very best, like no one ever was. Finally, before being done for the day, Fozzie returned one last time to really drive the point home. Although this challenge seems mighty, many believe one day someone will do it, but what will that take? According to the popular online blueprint tool by ‘Fuzzworks’, current build cost for this monster is 200 TRILLION ISK or roughly the equivalent of 1000 Avatar titans (assuming similar research/cost cutting procedures). To put this another way, the entire fight of B-R was valued at 11 Trillion ISK, so the destruction of this Citadel would be the equivalent of losing B-R 20 times. If you were to try to wallet-warrior your way into this structure it would cost you somewhere between six to ten million US dollars! While this may seem nearly insurmountable, and CCP seems to be confident it is, others already are beginning to speculate what may happen on the day two organizations attempt to put one up at the same time. Throughout history CCP has underestimated the playerbase, and while this is several orders of magnitude above anything seen before, we will still have to see if it will be enough to stop players from trivializing the pursuit. Additionally, once constructed, this castle in the sky stands to be the most strategically reinforced structure in New Eden. Not only will whoever builds it be invested beyond any measure, but the additional defensive systems, including double the required siege time thanks to the limited damage cap, will make any assault almost as unthinkable as the construction itself. One thing is clear. The gauntlet is thrown and CCP wants to know, who shall be the first to conquer the ‘impossible’ once again? While the Hordes and the Monkeys work to tear each other down, others are already beginning to plot. Two things are sure, the ‘Palatine’ will sit as the crown jewel in some empire, and the day it is sieged will be a day written about once again.